We have been developing Invest in What’s Next (IIWN), an interactive, online mini-course with the Federal Reserve Bank of Richmond. Through three lessons, students will explore their options, budget for their future, and build a plan that’s right for them. Karen Schwartz-Decker from our communications group contributed to this post. 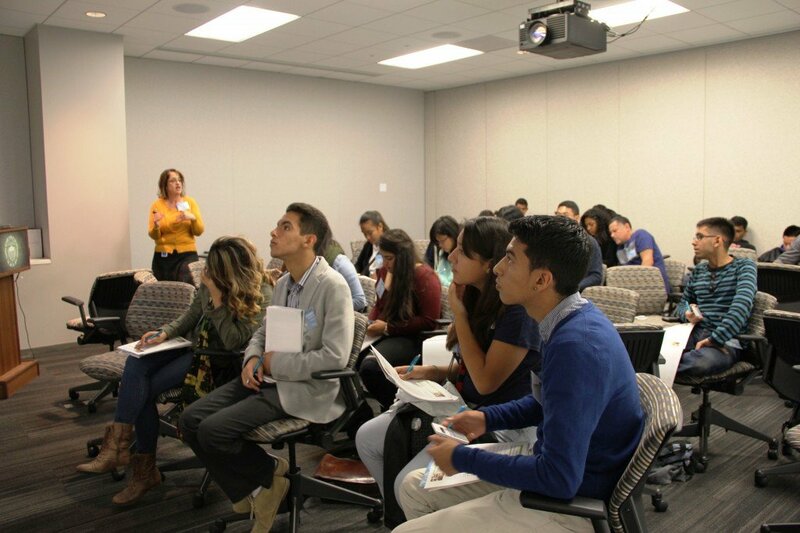 Last week, almost 100 students and their teachers from five Bay Area high schools and one adult school convened at the San Francisco Fed to learn about the importance of personal finance skills in planning for college and careers. 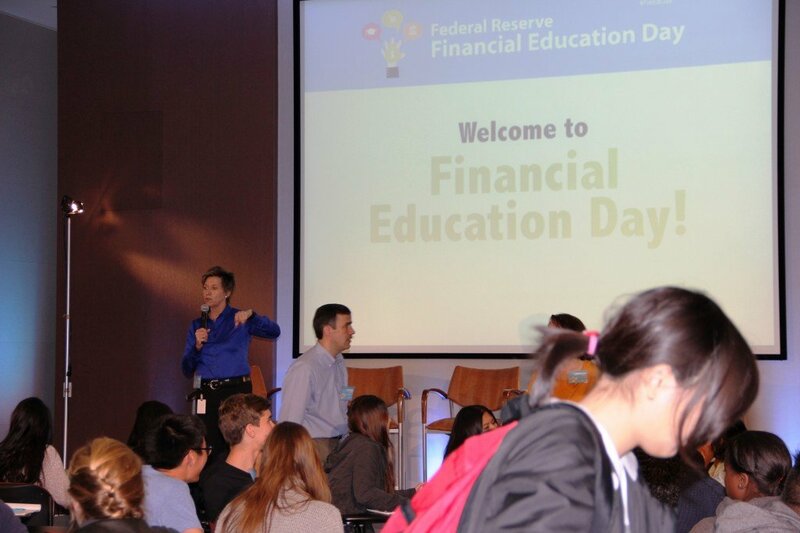 This was the second annual Federal Reserve Financial Education Day, which was established as a day of workshops at Feds around the System to provide tools for making wise choices when investing in education and planning for the future. 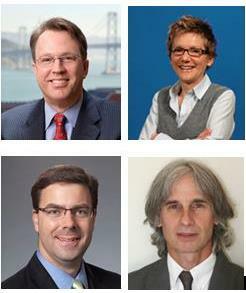 The SF Fed Economic Education Group hosted the event. In a series of morning breakout sessions, the students participated in a hands-on personal finance workshop facilitated by Lorraine Thayer and learned about the purposes and functions of the Fed from Steven Fisher. They also attended a session to learn about ways of financing college though scholarships. The presentation was delivered by Rema Oxandaboure, but was developed by Joel Bervell, a Yale undergraduate from Seattle who collected over $200,000 in scholarships before graduating from high school. This post is by guest writer Laura Choi, who is a Senior Research Associate with the SF Fed’s Community Development department. Laura researches a variety of issues aimed at improving economic opportunities for low- and moderate-income communities. Read her full bio here. With graduation season upon us, it’s a great time to get your students thinking about the future. There’s no question that a college degree is becoming more and more of a necessity in today’s economy. A recent Econcepts blog post highlighted new research from the SF Fed showing that a college degree is a worthwhile investment for the average student as it leads to higher lifetime earnings. But student debt doesn’t have to be crushing or scary, and a little information can go a long way in helping students make sound financial decisions when it comes to financing higher education. Here are a few ideas that can help your students get a better understanding of student debt. Join us in San Francisco on August 15 for an exciting and unique opportunity! Meet the Experts is a speaker series designed to provide secondary and post-secondary educators with an opportunity to interact with leaders from throughout the Federal Reserve Bank of San Francisco. Our objective is to foster greater understanding about the roles and responsibilities of the Fed and to highlight emerging issues in the economy. The event is a professional development opportunity that will bolster your knowledge about economics, and you will return to your students with fresh content and new teaching ideas. Set yourself up for success in the upcoming school year and register today. John C. Williams, President and CEO of the SF Fed. John is an expert on monetary policy and business cycles, and is a strong advocate for economic education. Mark A. Gould, First VP and COO at the SF Fed. Mark is responsible for all administration, operating, and financial services activities. He is also product director of the Federal Reserve System’s Cash Product Office. Mary C. Daly, Senior Vice President and Associate Director of Research at the SF Fed. Mary specializes in labor markets, public economics, and social welfare. Kevin Lansing, Research Advisor, Federal Reserve Bank of San Francisco. Kevin specializes in macroeconomics, monetary economics, and asset pricing. This event is open to high school, community college, and university educators. Students in teacher education programs are also welcome to attend. There is no fee for this event. We are still in the planning stages of this event, and details are subject to change. Please check back for updates. Last year’s agenda will give you an idea of the exciting and informative content that will be included in the day. Register now! We look forward to having you join us. Has the high cost of college tuition discouraged your students from considering college a viable option? A new study from our researchers here at the SF Fed suggests that a college degree is still a great investment for the average student. 1. Higher Annual Earnings: Although common knowledge, it’s worth repeating – college graduates, on average, out earn high school graduates year in and year out. In 2011, the difference between annual wages of someone with a four-year degree and a person with a high school degree averaged $20,050. 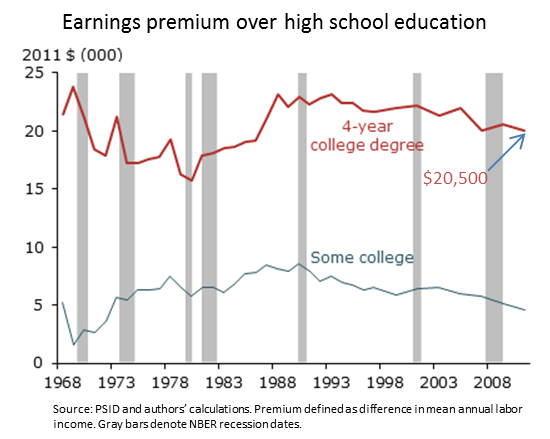 That’s a 61% earnings “premium” for having a college degree (see chart below). 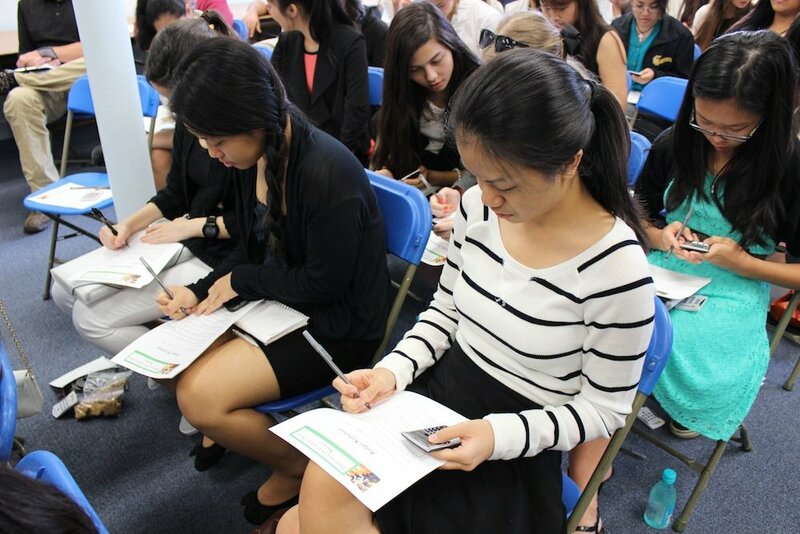 Last month, we had a great day of discussion on personal finance and entrepreneurship with nearly 400 amazing students from girls’ schools in Honolulu. We ran three interactive sessions designed to introduce students to the topics of budgeting, learning how to finance college, and understanding the purposes and functions of the Fed. The day was capped off with a panel discussion on entrepreneurial leadership. Students from Honolulu’s La Pietra and Saint Andrew’s Priory joined their peers at Sacred Hearts Academy for the day, supported in part by the National Coalition of Girls’ Schools (NCGS). Manage your money. Don’t let it manage you. Our session on personal finance stressed the importance of creating a budget, as well as the need to understand investment options, risk, and rates of return. Young people need to be proactive instead of reactive with their money. We used a modified version of this lesson plan during the session; feel free to download it and use it in your own classroom.